You may or may not have trim to paint. Again, you have the choice of covering the wall with painter's tape (wait until it's dry before applying tape) or going freehand. If applying paint to broader areas of trim, use a wide, straight-edged paint brush. 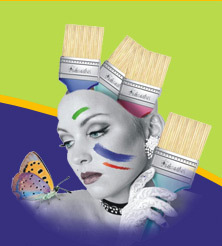 If applying paint to thinner areas of trim, use an angled brush (1- to 2-inch). Repeat the original process used to apply the paint for best results.